Wusikstation v5.x, Other Virtual Synth from Wusik. 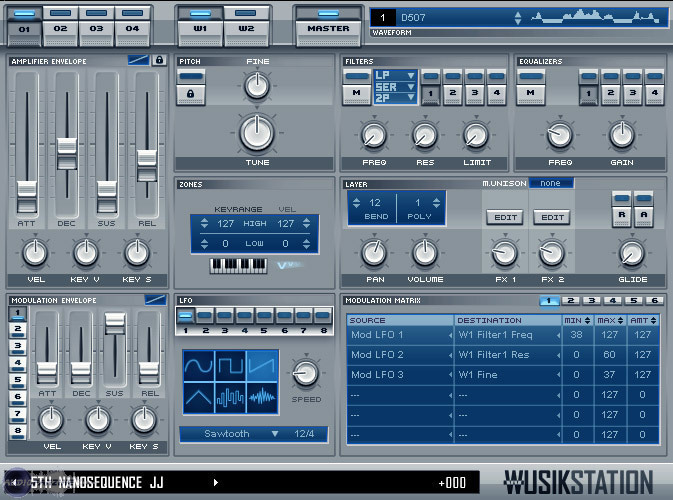 Wusik has updated Wusikstation to v5.8.0. New animated keyboard display at the bottom of the GUI. It also shows the current key-zones for the selected layer, and any possible key-switches with a different color. You can click on keys to audition presets. There's a master Hide/Show option in the Global Contextual Menu. New Modulation-Matrix Destinations. All Envelopes Attack, Decay, Sustain and Release levels (All Amp and Mod Envelopes). New Modulation-Matrix option. Real-Time (ON by Default). When you have a Mod-Matrix slot that doesn't need to be processed in Real-Time, you can turn this option to Off and save a lot of CPU usage. The processing will only be done when a new note is played. Added the above new WusikSND options to the new Integrated Sampler-Editor. More SFZ op-codes. PITCH_KEYTRACK=0, PITCH_KEYTRACK=100, LOOP_MODE=ONE_SHOT, LOOP_START, LOOP_END, OSCILLATOR=ON, TRIGGER=FIRST, TRIGGER=LEGATO, TRIGGER=RELEASE, OFFSET, SEQ_POSITION, (aka Round Robin, starts at 1) SW_LAST, SW_DOWN, SW_UP, SW_PREVIOUS, (Key Switches, -1=Default and -2=SustainPedal) LORAND and HIRAND (random sample selection on new note). New Choke-Group. Stop All. When playing a sound with this group setting, all other notes will stop. In the SFZ support, this is group 999. SFZ files. Mono and Stereo samples can be mixed together in the SFZ file now. Changed. Library compiler file checking. It no longer checks if the library file link is active, making the library compile process much faster. If you moved files around, you need to use the 'Fix' tool instead (file-browser->options->other options). Key Switching. You can set samples to play only when a certain key is pressed, or the sustain pedal is used. There are 3 options for the key-switching: Hold, Toggle and Select. Round Robin. You can set extra sounds to be played by the same key, in rotation. This removes the "gun-machine" effect when playing the same key. This is important for acoustic instruments and certain analog sounds. You can mix layers with and without round-robin. So if you want only one note to have round-robin, its possible. Mode Legato. Legato samples are only played after the first key is played. So it works like this: if your soundset has a legate sample, the first key will play a non-legato sample, all the other keys will play legato samples when found. Mode Release. When releasing the key, this sound will be played instead. The previous sound will fade-out and the new sound will fade-in (fast fade in/out). Sample Fine Tuning. You can adjust the fine tuning of each sample in a non-destructive way. Fixed Pitch Mode. Now you can mix-and-match regular and fixed-pitch sounds in the same soundset. Hold - the new switch area is used until the key is released. Toggle - the first hit selects the new switch area, the second hit go back to the default area. Select - each hit selects the new switch area. Information on the new WusikSND and WusikPACK files for programmers is available on this page. Tekky Synths Releases PsYkYx Tekky Synths has released PsYkYx, a synth made for deep and percussive kick drums. Waves February Discounts Waves is offering a 20% rebate on its L-Series of limiters and analog models until the end of February. Cluster Sound Minimalogic Cluster Sound launches Minimalogic, a multi-format library designed for Minimal productions: 500 Mb of loops & samples, basslines, percussion loops, micro breaks, construction loops, electro rhythms and more.